Obesity in Rottweilers & How to Prevent it ! 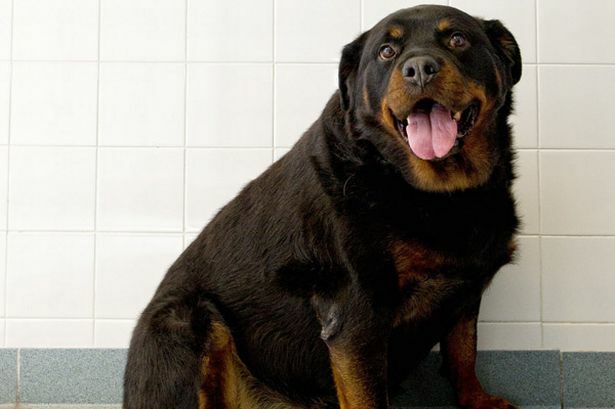 One of the best ways to prevent your Rottweiler's health problems is to keep his weight in a healthy level. Even if your Rottweiler is a puppy it must always be in a good trim form, not too fat. The weight in an abnormal level can cause the puppy stress and serious bone problems. Puppies should be fed three times a day until they are 6 months old, after they are six months old you can feed them two times a day. The feeding time is important, it is highly suggested that the time should be spread equaly. For example, 7 AM - 1 PM - 7 PM. The best way to prevent your dog's obesity is keeping them active with excercises and to keep a good feeding schedule, do not ever over-feed your dog. Also note that the excessive amounts of fat and calories in human foods can easily lead to obesity in dogs. The ideal weight is between 50 to 60 kg (110–132 lbs) for males Rotties and 35–48 kg (77–105 lbs) for females. Weight must be relative to height. How much per feeding for a 1 year old rottie and older?